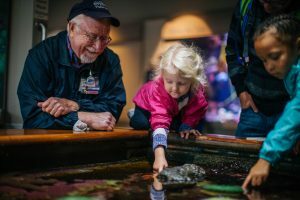 Newport, Oregon—The Oregon Coast Aquarium will honor veterans and active duty military personnel with free admission to an ocean of coastal and marine discovery on Veterans Day, Sunday November 11th. To receive free admission on Sunday, November 11, visitors must show military or veteran organization identification, discharge papers or other official military identification; families of deployed military personnel must show active duty identification. The Aquarium is providing free admission, normally $22.95 for adults, as an offer of thanks. Many of the Aquarium’s leadership, staff and volunteers are veterans themselves. Oregon Coast Aquarium volunteer and veteran Dr. John Buckhouse.